Decoys consists of 18 free-standing deer silhouette sculptures painted with florescent ultraviolet light sensitive paint. As the sun sets, hidden UV lights illuminate the herd, creating an eerie yet engaging scene of deer viewed with thermal imaging. 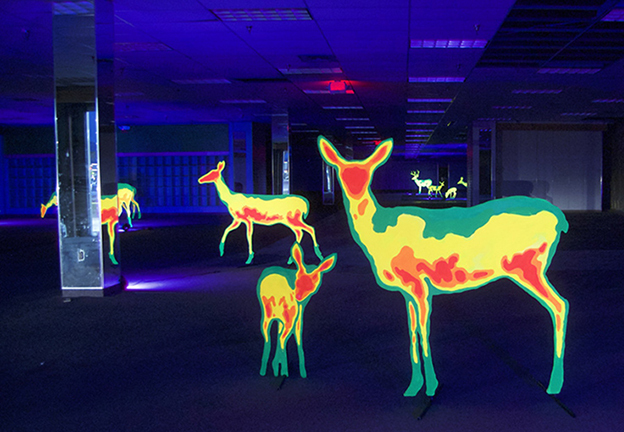 The artist painted the deer “decoys” with thermal imaging patterns to serve as a metaphor for the way technology has changed the way we see the world by revealing things we cannot see with our naked eye. The gently grazing herd is at once a reference to the natural world of the past and the “netherworld of new information” that we encounter as we move into an increasingly technological future. 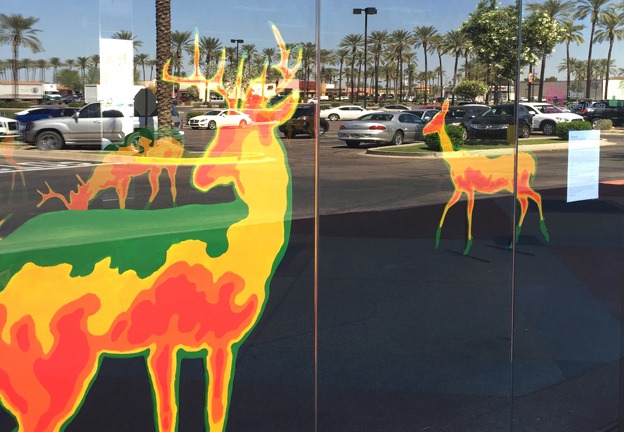 As passersby are lured in by the unusual scene of deer foraging in a storefront, they are invited to reflect not only what they are seeing, but how they are seeing it. This installation was made possible by funding from the DeRito Partners and managed by Scottsdale Public Art through the IN FLUX initiative. IN FLUX Cycle 6 brings together 17 organizations presenting 17 installations by local artists in 7 Valley cities and towns. Artworks on view April – December 2016. Opening Reception for “Hey, I Made This For You” by Daniel Funkhouser!